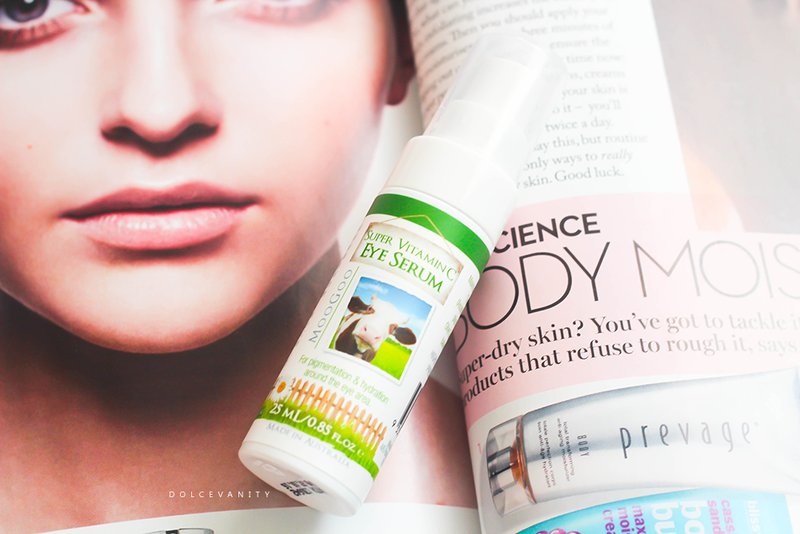 MooGoo Super Vitamin C Eye Serum. There's a few places in the world that I always think ahead of the curve with skincare, Switzerland, Iceland, Japan/Korea & Australia. I was first introduced to MooGoo by Lima - believe me she keeps her ears to the internet streets when looking for products & I'm totally grateful that she shares things with me. She asked if I'd heard of the company and introduced me to the Super Vitamin C Eye Serum. I had read and bookmarked the website and then just forgot as I do, so to my surprise when MooGoo reached out to me, I looked at it as the universe wants me to really try this brand. They sent me a range of products and even the aforementioned serum. MooGoo is an Australian company that have effective ingredients. The 'head of their herd' thought it was unusual that his mother was using a product made for cows for her skin condition. The 'Udder Cream' being used in dairy farms was designed to keep the skin on cow's udders in prime condition for milking. Although this cream was very thick to apply he set about making one lighter and non-greasy for humans. Now the brand have a range of products that help more skin concerns. This serum is based around an oil soluble form of Vitamin C called "Abscobyl Tetraisopalmitate" or VCIP. With most forms of Vitamin C being water soluble, the skin is protected by a layer of oil which means that water soluble Vitamin C doesn't penetrate well. While MooGoo's Vitamin C dissolves in oil and can be absorbed deeper into the skin. VCIP at this concentrate is good for pigmentation and sun damage and therefore is recommended for pigmentation around the eye area or other areas where pigmentation is a problem on the face. Looking at the above ingredients, it's very natural, 3 ingredients that you can recognise. I would go as far and say possibly vegetarian and vegan friendly but there's no official statement on the product information page that it is, so research and ask if unsure. The consistency of this serum, I'd say is a thick but watery fluid, one pump is more than enough and I only apply under my eyes or on any pigmentation on my face elsewhere. I prefer to use this at night, it can take a while for it to seep into the skin but when it does the skin is very hydrated. I'd say not to put it too close to your lash line as it has a habit of spreading outwards - VERY quickly. This week I noticed after roughly a month of daily use my eyes didn't look as dark. Maybe it was just me but that's all that matters, right? It appeared brighter once I had done my face routine, the undereye wasn't so bad. I still have to correct & conceal to brighten it a bit more but it's definitely not as bad as before. I'm going to add it more into my actual facial areas where there's bouts of pigmentation. For the vegetarians and vegans who do not consume/use animal derived ingredient products. We have quite a few vegetarians and vegans ask about our products and if they have any animal derived ingredients. Milk is the only animal derived ingredient we use in some of our products, like milk soap. Some people don't consume dairy which we understand. In the interests of ingredient education, there is an ingredient used in the leading "Beauty Bar"by Unilever that might slip under the radar of vegetarians though because it doesn't look "animal". That ingredient is "Sodium Tallowate" which is saponified beef fat. Tallow is the fat derived from the fatty tissue of sheep or cattle. Sodium, Magnesium and Potassium Tallowate are salts of the fatty acids of Tallow. All three ingredients are soaps and are used in the formulation of bath soaps and detergents. Ingredients you won't find in their products. ‣ PEG’s and Synthetic Penetration enhancers. I'm so far pleasantly surprised, it's something that you need to use regularly to get the benefits. Nothing is a quick fix but it's definitely one to try, I will certainly get another one, once this one is finished. As I'm definitely on the quest for brighter eyes. Have you tried anything from MooGoo? The amount of times we've discussed MooGoo and the name still makes me chuckle! I'm so pleased this works for you, I'm loving it too right now. It seems that Vitamin C does well for both of our skin. I'm thinking of peeling an orange and rubbing it all over my face to see if that works too, but maybe I'll save that for another day!